Tirumala Tirupathi Devasthanam well known as “TTD” is one of the famous, oldest and richest temples in southern India and it will open throughout the year. Every day nearly more than 1, 00,000 pilgrims (Lord venkateswara swamy devotees) visit the Shri Venkateswara Swamy Temple, Tirumala for darshan. 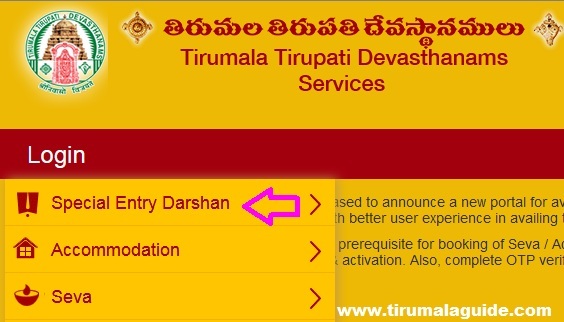 To reduce the darshan waiting time in queue lines, Tirumala Tirupathi Devasthanam introduces e – darshan tickets online facility where in the pilgrim is provided with balaji darshan slot remotely before actually the pilgrimned to reach tirumala. For getting the three hundred rupees darshan tickets. But now you can book tirumala darshan tickets with in 5 minutes through your computer/ mobile phone. Along with these 300/- rupees special darshan tickets, pilgrims can book the rooms for accommodation and special seva tickets through the TTD official website ” www.ttdsevaonline.com” . There is no Tirupati Tirumala Seeghra Darshan Rs300/- Tickets will be issued in tirumala. So online booking is the only way to get the special darshan tickets. For special darshan tickets & seva tickets or rooms accommodation booking pilgrims need to register as a pilgrimages or a donor in ttd seva online website. Every day nearly 13,000 thousands tickets are available in portal for booking. Book TTD Rs.300/- special darshan tickets through online The below is the information regarding booking procedure. How to Book Tirumala Rs 300/- Special Darshan Tickets Online? Visit the official website of the TTD @ ttdsevaonline.com. Signup with your Email ID & mobile number then enter all the details and submit it. User name and password is sent to your registered e-mail address and logon to the website with this official website. Please this process in advance before you intend to book tickets online. Before booking the online darshan tickets you must check the available dates for the special entry darshan (or) Seegra darshan time slots you had planned to book. After that you have to enter the personnel information of the pilgrim for whom you are booking and the other accompanying pilgrim’s details, if any. After entering the details you directed to the online payment process for the tickets you have booked. Only maximum of 6 tickets can book for on one person account. For booking Seeghra dharshan ticket slots you are allowed to book in advance between a minimum of 3 and maximum of 90 days a head of your schedule. One can get the special darshan tickets through TTD online website/ post office/ e-darshan counters. The below are the complete detail regarding online quota of special darshan tickets. In TTD official website slots will open from morning 10:00 A.M to evening 5:00 P.M.
And the tickets will have to book in advance of 56 days. Around 10,000 tickets are available. Devotees can also book 300 rs darshanam tickets from nearest post offices also. In post office slots will open from morning 10:00 A.M to afternoon 2:00 P.M.
Nearly 5,000 tickets are kept online for booking. And you can also get from e-darshanam counters in TTD kalyana mandapams. But in this counters you can book tickets before 14 days of the darshanam. Only 2500 tickets are available. Who are booked for 300 rupees darshan tickets through official online website “ttdsevaonline.com”. After completing special entry darshan pilgrims want to collect 2 small laddus prasadam at laddu counters (Temple Outside) in tirumala.